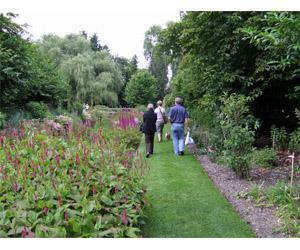 Group Visits at Gooderstone Water Gardens01603 712913work Group VisitsNorfolk's pleasure garden. Six beautiful acres with four ponds, waterways, trout stream, 14 bridges, mature trees and shrubs, colourful borders, an 8 acre nature trail and kingfisher hide. Delicious homemade cakes, plant sales and lots of seats. A unique attraction for all garden lovers, naturalists, artists and photographers or those who simply want a restful break. OPENING TIMES: Garden open all year, daily 1000-1730 (or dusk). Tearoom open 2 April to 30 May, weekends and Bank Holidays. Daily from the 31 May (except Mondays). Garden and tearoom closed 29 May, 24 to 26 June. Norfolk's pleasure garden. Six beautiful acres with four ponds, waterways, trout stream, 14 bridges, mature trees and shrubs, colourful borders, an 8 acre nature trail and kingfisher hide. Delicious homemade cakes, plant sales and lots of seats. A unique attraction for all garden lovers, naturalists, artists and photographers or those who simply want a restful break. Free preliminary visit for group organiser, coach parking on site, coach drop off/pick up point, coach driver concessions and facilities, guided group tours, evening visits by arrangement, toilets, picnic area, cafe/restaurant, wheelchair access. Admission per person for groups (15+ people) - Adults £4.75, Children (6 to 16 years) £2.00, Concessions £4.25. Normal admission prices - Adults £5.50, Seniors £5, Children £2.00.